Are you a firm believer of taking collagen supplement to keep your skin beautiful and tight? Have you wondered why the minute you stop taking collagen supplements, your skin looses its suppleness? Besides hydration and collagen, do you know what your skin actually need to stay healthy and youthful? The missing key ingredient is antioxidant. Your antioxidant protection response starts to decline as early as in your 20s. This decline accelerates as we age, and is central to subsequent decline in our skin cell functions, leading to wrinkles and sagging skins. What happened when you’re in your 30s and 40s? As you reach 30s, your lymphatic drainage starts to slow down and you cannot get rid of toxins as quickly as before, resulting in puffiness and dull skin. The bioenergy also drops, thus slows down the creation of collagen, repair processes, and even absorption of ingredients applied to your skin. In your 40s, the natural life cycle of skin cells is arrested, cell regeneration slows down. Have you noticed that your dark spots or scars are now slow to lighten up? The cream that used to work doesn’t seem to work anymore? In fact, researchers studied women who appeared at least 10 years younger their age, found that these women’s skin was somehow able to robustly renew itself through the decades. The antioxidant decline typically seen in the 20s still hadn’t happened by their 50s. That means, women who look younger somehow are able to maintain their antioxidant level, arrest the decline and keep it at the same level as in their 20s. How can one do that? First, you need to know how much antioxidants your body needs. Check out our other post on “Are you getting enough antioxidant?“. Do note that if you live or work in a high-stress environment, you will need more than the average antioxidants units to combat the oxidative stress your body is going through. Then, try to get all you can from fresh fruits and vegetables, as suggested in our “Are you getting enough antioxidant?” post. 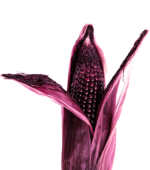 Failing which, or for convenience, you can try our Antioxidant Peruvian Purple Corn extract 30:1, with a spectacular Antioxidant ORAC value of 96,300 µmoleTE/100g, 20x more antioxidant value than fresh blueberry (4,669 µmoleTE/100g)! Just one teaspoon a day is what you need. Another key step in keeping your skin healthy is to improve the toxin removal process. 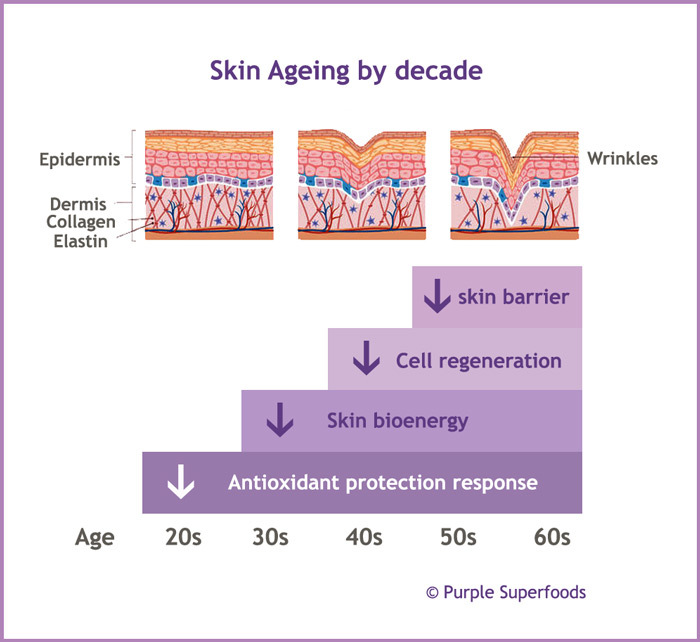 Referring to the skin ageing chart above, by 30s our skin’s bioenergy is declining and hence slowing down the removal of toxins. Acne, rashes, and other skin problems may be a sign of toxin overload. There are many detox remedies in the market which you can try. 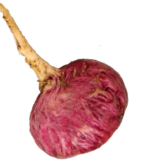 But you may or may not heard of this plant which has been used for over 2,000 years to detox our liver – milk thistle – as it is more popular in the Western countries than in Asia. Milk Thistle is a flowering plant in the same botanical family as sunflowers and daisies, commonly grown in the Europe. 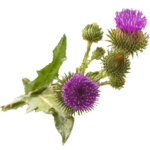 Dr Axe has written about the 7 restorative benefits of milk thistle and you can read it here. 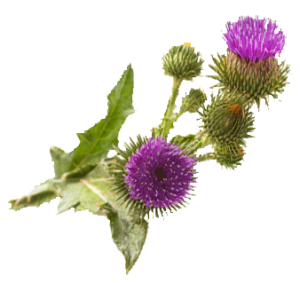 Apart from being a great detoxifier, milk thistle is also full of antioxidant and is mosturising to the skin! Discover what our customers said about our Organic Virgin Milk Thistle Oil here. 3. Regenerating and reboost your skin cells? Wouldn’t it be nice if you can keep the baby-like supple and smooth skin you used to have? As we reach the age of 40, our skin cells can no longer regenerate as fast as before. This is when most people take collagen to supplement their skin, without addressing two other fundamental problems – antioxidant and detoxifying – as described above. Other than collagen, many didn’t know that there is one other secret ingredient that our body produce naturally to keep our skin structure intact. It is squalene, an unsaturated oil that stimulates natural metabolism for our cells to undergo the much needed regeneration process. We lose about 12% of squalene through our skin secretion. The best plant source of squalene is from amaranth seed, an ancient grain cultivated hundreds of years ago by the Aztecs, and used as a food and medicine. Amaranth has 10x more squalene content than olive oil. Being skin-identical, squalene from amaranth seed is light and not overly occlusive like other facial oils. It helps promote skin healing, protect our skin barrier from stress of daily life (pollution, sun, etc), thereby combats the appearance of skin aging such as fine lines and wrinkles. There is also another benefit of amaranth oil, which involves a rare amino acid called lysine that our body cannot produce naturally. This increases your calcium uptake efficiency and helps to keep the hair on your head, strengthening your hair follicles. Adding amaranth oil in your daily diet e.g. soups, salad dressings will beautify your skin and hair from the inside out. You can also use it topically for added immediate results. 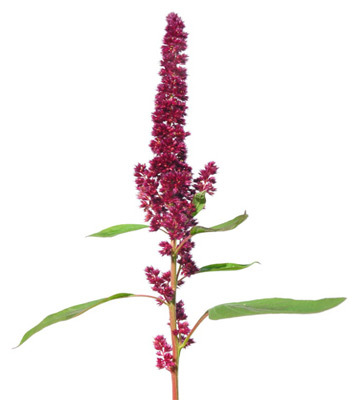 Read why our customers love our Organic Virgin Amaranth Seed Oil here. Here are our 3-step recommendation to renew your complexion from inside out, was it helpful? Tell us by writing your comments below.